As mentioned, I have just started studying Ugaritic at Sydney University. Unlike many other ancient languages, Ugaritic is still very much open to interpretation. In order to demonstrate this, I have decided to post a short text in Ugaritic, about which I know absolutely nothing. If anybody has any suggestions as to its meaning (it looks like a list of items to me, perhaps an inventory), then I welcome your opinion! Due to font problems, I have typed it up on Mellel but have attached it here as a picture. Seems that, of the many languages that WordPress might enable one to use, Ugaritic is not one of them. Pretty, isn’t it? Well, while it might look complicated, the alphabet is actually rather simple: the difficulty lies in simply recognising the signs on the tablet. The letters themselves are not too dissimilar from the letters of the Arabic alphabet, and are even believed to have existed in an order that was utilised for certain types of South Arabic and partly, I was interested to note, Ge’ez. One sign here has not been reproduced by me and that is from the fourth line, written (seemingly) as a ligature with the sixth symbol. It looks like the Akkadian /a/, used in Babylonian texts (along with the plural determinative) as the logogram for ‘water’. In our text it is written in minature and placed slightly to the right and beneath the letter in question. As my fonts were not able to produce that symbol, I have unwillingly omitted it here. Another quick note, before we move to the transcription. The short vertical strokes found throughout the text (such as between the third and the fifth letters of the first line) are actually word-dividers. They do not always appear where we might want them, and their presence can sometimes also be mistaken for a gimmel (such as is found as the second letter of the final line). The transcription, as it appears above, is my own and may therefore be a misreading of the actual text in question. So, what does it all mean? Well, the obvious words are the numbers. We have ‘seven’ written three times (twice as part of a longer word; lines 1 and 6), ‘ten’ three times (lines 3, 6 and 9), ‘five’ twice (lines 4 and 5), ‘four’ once (line 8), and ‘eighteen’ once (line 2). We also have what appears to be ‘one hundred’ in the second last line. As for the final line, unless I am mistaken this looks like a formulaic closure, related to the root √גמר. Of course, I could be very much mistaken. If anybody has any suggestions then I am all ears. 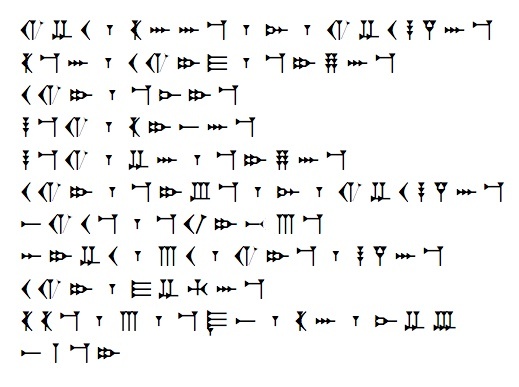 My next class is on Thursday and I hope to be able to add to what I have written here then; in the meantime, if anyone would like Ugaritic fonts then I can recommend the work of David Rosenbaum, the creator of the font that I am using. It is very easy to use, and it looks a whole lot tidier than any of the alternative fonts that I found. This looks like KTU 4.173, which is some kind of list, perhaps a military payroll or payment to someone for the use of troops. The last two lines might be translated “162 heavy (shekels) total.” The words following the numbers are likely military titles. For example, in lines 2 and 5 the mrynm may be some kind of charioteers. But who are the bn mrynm? I do wonder what that syllabic A is doing there. Now, that is more help than I ever got on my homework! This is, indeed, KTU 4.173! I meant to have mentioned that: my apologies. Thankyou for your observations; this isn’t real homework, so neither of us need feel guilty about you assisting me! (*whew*). Now, when I add all the figures together (and assume that the number at the start of line 7 is a 90), I get 173. Clearly, I have miscalculated 11 somewhere or other: do you get a total of 162? How about a recipe? Each number would refer to the number of “parts” of the ingredient added. And, depending on how you read the numbers the total comes reasonably close to one hundred. Maybe the second last line is something like “make it up to one hundred parts”. I started to write a comment addressing a couple additional issues that you mentioned but it got a little out of hand, so I decided to post it at my place. The idea that this text might be a recipe would be more intriguing where it not for the fact that we know many of the “ingredients” to be military personnel. Is there a special font in Mellel for the transliteration with the diacritics, or you had to add all those manually? God bless Mellel, but I’m afraid I had to add them all manually. There probably is a way of doing it, but if there is I don’t know how. Let me know if you find one: it would save a lot of time. I did work with a professor who did comparative Semitic linguistics, and though he wasn’t very computer literate, he found that DavkaWriter of all things had the easiest interface for diacritics. Thanks for your response on my Esther comment. I’ll be checking back here often, from now on. I happened across your website today and noticed you discussed Ugaritic. Recently, we at Logos Bible Software have acquired a number of Ugaritic works, with the intention of developing an electronic version of each. You can see what we offer here: http://www.logos.com/products/prepub/details/2954. The Logos editions will be fully searchable, and all references and footnotes will operate as hotspots, immediately presenting the cited information whenever the cursor rolls over them. All this and more make these esteemed works even more useful for study. And you can help us see these products get the attention they deserve! Contact me for more info: zrock [at] logos [dot] com. If the Logos guy had seen that we were just discussing Mellel, he probably would have thought twice before posting. I’d never heard of Logos before (I don’t think); funny how everyone is choosing a foreign-language adaptation of Microsoft’s “Word”! And, yes, I do run Accordance. I don’t use it so often (only when I’m too lazy to use my Even-Shoshan; most of the searches that I’ve done lately have been lexical) but it was invaluable during my Honours year. Finding every instance of a locative-heh according to classification is impossible without a program. Makes me feel rather humble when I consider the scholars who worked on these things in the pre-computer age.